Phylogeny after Nazari and Sperling, 2007. The genus Archon has three morphologically similar species, all of which feed on Aristolochia. 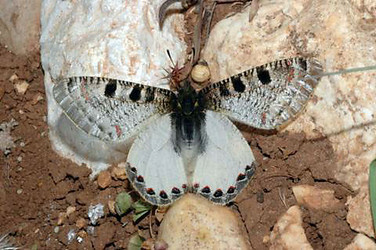 Two of these species, A. apollinusand A. apollinaris, which are distributed in the Middle East to Turkey and Eastern Europe, were distinguished in the 1980s, based on differences in life stages and genitalia (De Freina, 1985). Their status as species was confirmed by the discovery of their sympatric occurrence in southeastern Turkey (Mardin) and their intersterility (Carbonell, 1991). The third species, A. bostanchii, originally described as a subspecies of A. apollinaris, was separated in 2007 based on a comapartive study of molecular and morphological characters (Carbonell and Michel, 2007; Nazari and Sperling, 2007). The relationship between A. bostanchii, A. apollinaris and A. apollinus is unresolved, although A. bostanchii might be basal to the other two species (Nazari & Sperling, 2007). According to Hemming (1967), Papilio thia Hübner, [1805-1806], originally assigned as the type species of Archon, is a subjective synonym of Papilio apollinus Herbst, 1798 because it essentially represents the same taxon at the species level. The name Doritis (auct. nec Fabricius, 1807) has been incorrectly considered for a long time to have Papilio apollinus Herbst, 1798 as its type species, but this is invalid because it is a junior objective synonym of Parnassius Latreille, 1804 (Hemming, 1967). This confusion is due to the fact that Hübner (1819) used the name Doritis for Papilio thia, which was followed uncertainly by various authors until in 1872 Crotch even selected Papilio apollinus Herbst as the type species of Doritis (Hemming, 1967). The name Dorarchon was proposed by Rothschild much later in 1918, and is a junior synonym of Archon (Hesselbarth et al., 1995). Carbonell, F., 1991. Contribution à la connaissance du genre Archon Hübner 1822: Découverte de zones de sympatrie pour Archon apollinus (Herbst) at A. apollinaris Staudinger (Lepidoptera: Papilionidae). Linneana Belgica 13: 3-12. Carbonell, F. and Michel, M., 2007. Une espèce jumelle méconnue du genre Archon Hübner, 1822 (Lepidoptera, Papilionidae). Bulletin de la Société entomologique de France 112 (2), 2007 : 141-150. De Freina, J.J., 1985. Revision der Gattung Archon Hübner 1822 mit Angeben zur Biologie, Verbreitung, Morphologie und Systematik von Archon apollinus (Herbst 1798) und Archon apollinaris Staudinger  1891 (stat. nov.) (Lepidoptera, Papilionidae). Nota Lepidopterologicae 8: 97-128. Hemming, A.F., 1967. The generic names of the butterflies and their type-species (Lepidoptera: Rhopalocera). Bull. Br. Mus. Nat. Hist. Ent. Suppl. 9: 509 pp. Hesselbarth, G., van Oorschot, H., Wagener, S., 1995. Die Tagfalter der Türkei. 1. 754 pp. Bocholt, Selbstverlag Sigbert Wagener. Nazari, V. and Sperling, F.A.H., 2007. Mitochondrial DNA divergence and phylogrography in western palaearctic Parnassiinae (Lepidoptera: Papilionidae): How many species are there? Insect Systematics and Evolution, 38(2): 121-138. Page: Tree of Life Archon Hübner, 1822. Authored by Vazrick Nazari and Frédéric Carbonell. The TEXT of this page is licensed under the Creative Commons Attribution License - Version 3.0. Note that images and other media featured on this page are each governed by their own license, and they may or may not be available for reuse. Click on an image or a media link to access the media data window, which provides the relevant licensing information. For the general terms and conditions of ToL material reuse and redistribution, please see the Tree of Life Copyright Policies.